A high fibre diet can affect the absorption of many drugs taken orally (swallowed), and so reduce their availability to the body. 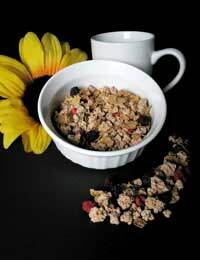 However, a high fibre diet is important for maintaining a healthy weight, preventing digestive system and other diseases, and generally keeping well. Maintaining consistent levels of fibre in the diet will keep drug levels stable, and avoiding taking drugs at the same time as the high fibre food could help. Before changing diet, or if you have any concerns about specific drugs and a high fibre diet, discuss this with a doctor or pharmacist. By slowing the exit of food from the stomach into the small intestine, where nutrients and drugs are absorbed, a high fibre diet can slow the rate of absorption of drugs in the small intestine. This could be a problem for drugs that rely on fast absorption, such as those that promote sleep (hypnotics), reduce pain (analgesics) or produce calm (sedatives). A high fibre diet can reduce the effect of specific drugs, because these drugs can bind to the fibre in the food. This will reduce the availability or absorption of the drugs, so reducing their effect. Fibre comes in two types – insoluble, found in wheat and corn bran, fruit and vegetable skins, and leafy vegetables, and soluble, found in oat bran, fruit (pectin), beans and peas, and psyillium husk (from the seeds of a plant). Digoxin (used to treat heart failure and other heart conditions) binds to insoluble fibre, which reduces its availability to the body. Soluble fibre binds to lovastatin and other statins (used to reduce cholesterol), reducing the levels of the drug. Soluble fibre also binds to paracetamol (a painkiller), and can reduce blood levels of carbamazepine, a drug used in epilepsy, lithium, used to stabilise mood, and penicillin, an antibiotic. Steroids (including oestrogen) bind to both soluble and insoluble dietary fibre. High fibre food can reduce the absorption of tricyclic antidepressants, including amitriptyline, doxepin and imipramine, and so reduce the levels of the drug in the blood. Fibre supplements can reduce the absorption of drugs used to treat diabetes, such as glyburide and metformin. The absorption of vitamins and minerals can be reduced if taken with foods with a high fibre content. For example, rice bran can reduce the levels of calcium in the urine. A high fibre diet can reduce the absorption of iron. Increasing the intake of vitamin C, which improves the body’s absorption of iron, should compensate for this. Eating too much fibre could potentially make foods pass through the small intestine too quickly, so that too little of the drug is absorbed. Some drugs, such as codeine and propoxyphene (painkillers), oxybutinin (used for urinary problems), verapamil (used to treat high blood pressure) and some drugs for epilepsy can cause constipation. Eating plenty of high fibre food and drinking plenty of water can help to reduce this effect.